Articles - Multi-screen version of Theta-Meter e-meter. How to make three e-meters using only one Theta-Meter? What should you do to see 3 e-meter interfaces at three different devices getting data from one USB Theta-Meter e-meter? Plug USB Theta-Meter e-meter to Theta-Meter Wi-Fi Access point. Connect power source to the Theta-Meter Access Poin light by connecting external power adaptor, the battery or simply turning on the power at the Theta-Meter Wi-Fi Access Point with the battery. Waiting for the end of access point booting. This is smaller than one minute. Connect your computer, tablet or phone to the access point as you normally do this. At the computer device student working with run Theta-Meter program and in the Settings select the Theta-Meter Wi-Fi. This is the standard way to work with Theta-Meter Wi-Fi Access point. Now two other devices (twin and supervisor) also connects to this access point. Run on these devices Chrome browser (FireFox or Opera also possible). Safari is not supported. In the address line of the browser type the address 192.168.1.1/tmr and then press Enter. 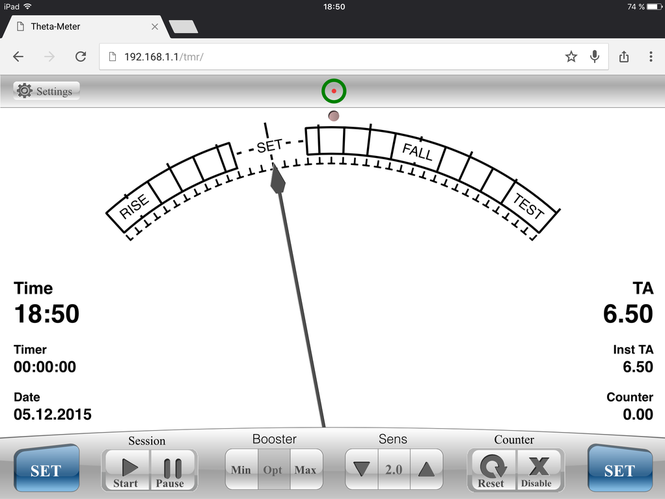 You see the interface of web version of the Theta-Meter. How to use it, you can see here. As a result each of 3 people will have their own version of the e-meter in front of theirs eyes, showing what sends USB Theta-Meter via access point.